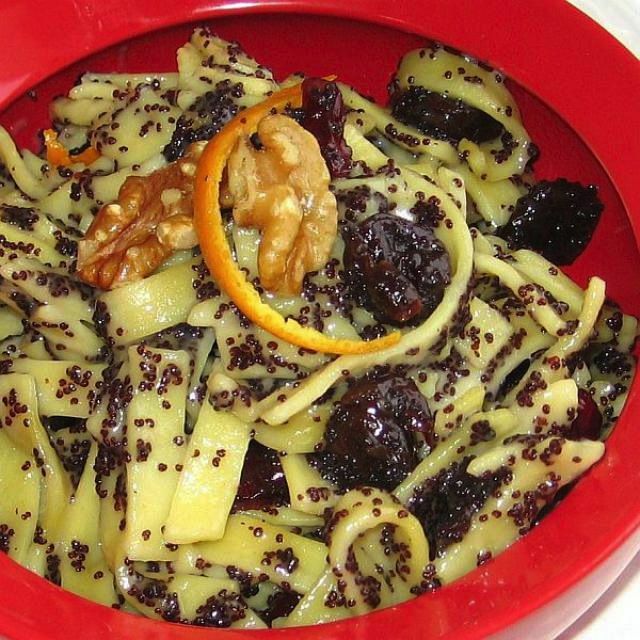 This recipe for Polish noodles with poppyseeds or kluski z makiem (KLOOSS-kee z MAH-kyem) is one of the traditional dishes served for wigilia or Christmas Eve dinner. The recipe varies by region. Some add nuts, candied orange peel, or raisins when it becomes kluski z makiem i rodzynkami (rraw-jin-KAH-mee). Modern families use purchased egg noodles and poppyseed filling, but many still make their own kluski and grind their own poppy seeds. This dish is often a substitute for kutia. Poppy seeds are always present because they represent wealth in the coming year. In a large saucepan, bring poppy seeds and milk to a boil. Cover and let stand for 12 hours. Put poppy seeds in a sieve to drain off any liquid. Grind the poppy seeds twice. Mix ground poppy seeds with honey, raisins, nuts and orange peel, if using. Transfer to a saucepan and heat through. Combine warm egg noodles with 2 tablespoons butter and poppy seed mixture. Serve hot as a side dish or dessert.